Frances Mayes and Ed Kleinschmidt continue to improve their 200-year-old-plus home, called Bramasole. This image, online via "Living Winsomely," depicts how Bramasole appeared in 2012. Click on the image for a great view. Cortona is a walled town. Living within those walls, for Frances Mayes, is like living inside a castle. When she first fell in love with the place, Frances didn’t know the property’s history. A former resident helped her learn some of the stories related to her house. Italian farmers down the road think of it as “new” since their homes are a thousand years old. Abandoned thirty years, the property needed a great deal of work. Inside, as she cleared away decades of neglect and whitewash, Frances discovered a fresco in the dining room. It depicts a lovely scene of Lake Trasimeno surrounded by Italy’s Apennine Mountains. Outside, she pulled brambles away from an old vineyard. Perhaps Bramasole would produce a grape harvest again. As she breathed new life into her 200-year-old home, Frances began to recover from an unexpected end to her first marriage. It had lasted twenty years. With Ed Kleinschmidt by her side, she focused on the future, not the past. When the house was still empty, locals had picked cherries, figs and daffodils (those yellow spring flowers which William Wordsworth so beautifully described). After Frances bought the property, people still helped themselves to the fruit of the land. 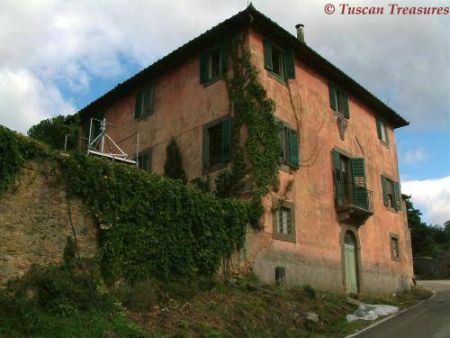 After all, abandoned farm houses were not unusual in Tuscany at the time. Entire families had not returned to their homes after the war was over. Looking over the valley, from her vantage point at Bramasole, Frances and her guests see an ever-changing light. Hues—which alternate from blue, to rose, to golden—blanket the landscape. Under the Tuscan sun, sunflowers bloom for six weeks. At night, during August, Italy celebrates San Lorenzo - the night of the shooting stars. Using her kitchen, which opens to the outside, Frances always has a party that night. It promotes a sense of well-being, she says, to have dinner al fresco. With the Tuscan sun shining by day, and shooting stars entertaining by night, who could disagree that, in Italy, Frances Mayes has found her own sense of well-being? Bos, Carole "BRAMASOLE" AwesomeStories.com. Oct 01, 2003. Apr 25, 2019.